In these last two weeks before Election Day, some American voters are not connecting with the big issues being covered by the political candidates, like immigration, international trade, or global warming, because they can’t relate to them. Instead, voters are more interested in issues that impact their everyday lives, like finding a good-paying job, affordable housing, gas prices and taxes. How do we get to the heart of the matter to find what’s most important to people? We engage in open dialogue. Open conversation begins at home. What is most important to you as a single person? As a couple? As a family? As a single parent? As an extended family? Name your top three priorities. Talk to the people in your household about these issues. I grew up in a middle class household. My dad worked in a steel mill, and my mother was an elementary school teacher. They wanted a better life for each of us kids. Since they both lived through the Great Depression, they knew they needed to save for the future. Together, they created a financial savings plan for our family. They didn’t know what the future held for us. Their number one goal was financial security. My mom and dad took me to the bank and opened a passbook savings account for me when I was in elementary school. They taught me to value money (and savings) at an early age. That lesson began at home. Initiate dialogue in your workplace. If you want to know what’s on the minds of your employees, involve them in one-on-one conversations, open forums, focus groups, or surveys, asking what is most important to them. Go beyond traditional employee satisfaction surveys. Dig deeper. Their wants, needs and desires may reveal different ways to look at the workplace, the structure of your organization, or introduce innovative ideas for creating a better work environment. If you don’t ask, you will never know. In a job interview for the position of Director of Marketing for an urban development firm early on in my career, the interviewer, who was the owner of the company, asked me a question, “What do you know about real estate?” I could have answered “Nothing.” Instead, I countered with another question: “What can you teach me about real estate?” You see, I knew about marketing and public relations, which was my field of study, and I could easily apply that knowledge to the real estate industry, which is exactly what I told him. I admit, my creative response to his question was a bit risky yet necessary. I got the job. I got the job because I asked an important question. Host a community forum. Cities and counties can do more to understand the needs of the people living in their local communities. If citizens’ voices are not heard, decisions are made in a vacuum. All too often, we hear about companies moving or closing when it’s too late. A different narrative is possible when people in communities are involved, truly involved, in conversations that lead to making important decisions. Open a dialogue with elected officials. Within our American political system, we elect officials to represent us. However, if those elected officials don’t know what’s on our minds, they can’t really represent us. Write a letter, send an email, call your representative’s office, or show up when town hall meetings are held in your area. Make your voice heard. Whether you are in a leadership position or not, find a way in your home, workplace, community, and country to open a dialogue that leads to greater understanding of what is important. When change is needed, that change will be made from an informed position because you let your voice be heard. With less than three weeks before Election Day, the spin of this year’s U.S. Presidential political campaign is spinning out of control. I spent the first half of my professional career in public relations and marketing, so I know what spin looks like, sounds like, and feels like. Just so you know, spin is the action taken by public relations professionals to meet the objectives of their PR campaign. 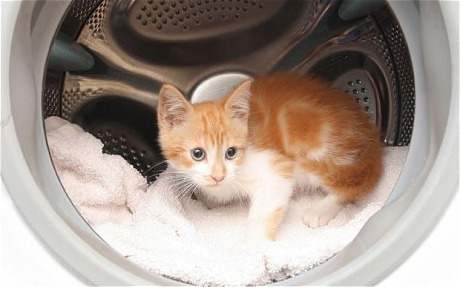 Spinning or fluffing can often be defined as the art of presenting something negative in a more positive light. The person creating the spin is called a spin doctor. One of the most frequently used words by the media regarding this year’s Presidential campaign is “unprecedented.” We have never seen anything like this, and hopefully we will never see it again. For the educated professional like me, I can tell a spin when it’s in action. It has a certain look, sound, and feel to it. No matter what the negative charge or accusation, the spin that follows is either appalling or amusing to me. I can see right through it. But average Americans who don’t have a public relations background have no clue what’s happening. They don’t see the strategic spin for what it is. They take the words that were spoken by the candidate or their surrogates verbatim and begin repeating them as if they were the truth. What has happened in this election is that those spins don’t just get summed up in one or two sound bytes, get featured for a day, and then are dropped. Instead, that spin remains spinning for days or weeks until we, the American voters, feel like we are trapped in this perpetual spin cycle. We have witnessed a series of spins in recent weeks. Recently, the national media aired an audio recorded conversation between Donald Trump and Billy Bush while they were killing time preparing for an interview with Access Hollywood back in 2005. The language used by the media and the public presented a deeper issue, which was potentially harmful to Donald Trump’s campaign: his sexual misconduct, which was then referred to as sexual assault. Trump’s spin, which included the phrase “locker room talk” tried to minimize, even dismiss, his behavior. What happened next? Women were outraged. Multiple allegations of sexual assault came pouring in from women stating that Donald Trump had fondled, kissed, or groped them in the past. The “locker room talk” spin has dominated the news cycle for nearly two weeks and doesn’t show any signs of stopping. Building on the locker room talk spin, Donald Trump said all of these allegations were fabricated, which is another spin. Even Melania Trump came to her husband’s defense in an interview with CNN’s Anderson Cooper, referring to the incident as “boy talk” and suggesting that Billy Bush initiated the conversation. Let me add one note worth mentioning. Melanie Trump’s comments came more than ten days after the Bush-Trump tapes were leaked. Timing for this defense did not work in Trump’s favor. Even Stephen Colbert’s Melania Trump surrogate, Tony Award winning actress Laura Benanti, joined the Donald’s defense. The latest spin of the Trump campaign is that the entire 2016 U.S. Presidential election process is rigged. Many Republican and Democratic leaders are speaking up, defending the American electoral process. And yet the spin is out there and continues to grow. Listen to the key words or phrases from these recent spin cycle examples: Locker room talk, fabricated, boy talk, rigged. When does it end? I would like to say it will all end on November 8, 2016, Election Day, but I know better. These multiple spins have some American voters’ emotions running high. Let’s not get swept away with talk. Instead, let’s focus on the issues. America has more important work to do, and we need to do it together. No opening handshake. The media repeatedly described this behavior as “unprecedented.” I agree. Even when you dislike or disagree with an opponent, you still extend the courtesy of a handshake. Knowing what had transpired in the media leading up to the second debate, we can certainly understand why there was no handshake. I am surprised that no one in the media mentioned how honest this gesture was. It revealed deeper emotions. Trump’s dominant, invasive physical stance. 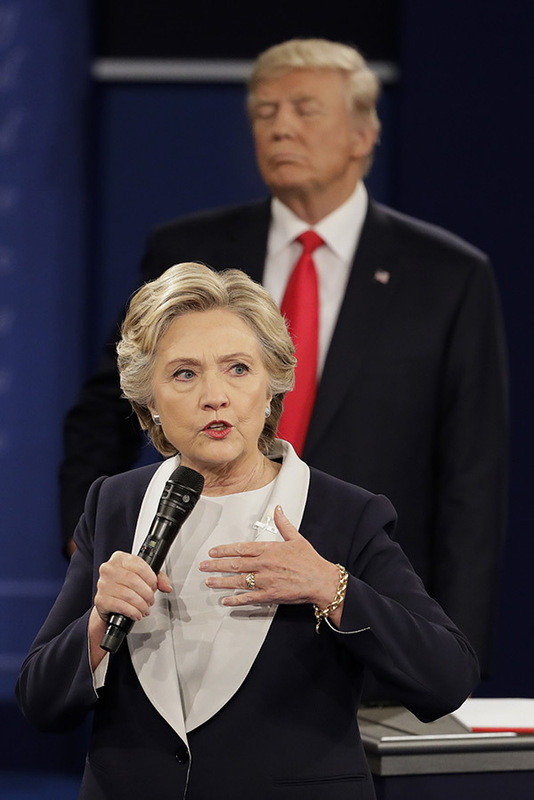 Throughout the debate, Trump physically stood close to Clinton while she answered audience questions, sometimes standing right behind her, invading her personal space on the platform. The media (and women, I might add) picked up on this right away. Words like “stalking” have been used in media reports. In a professional arena, such as a debate platform, candidates follow certain protocols or extend courtesies to one another. Candidates have their own designated seated areas. While they are allowed to walk to any part of the platform, they remain mindful of their opponent’s physical position. Trump continued to break protocol. He also wandered and paced the platform while Clinton responded to audience questions, which could be interpreted as a lack of respect or a lack of engagement. Clinton’s appropriate use of the platform. Clinton came closer to audience members when answering questions, creating an intimate space for dialogue. She followed platform protocol and did not invade Trump’s physical space at any time. Trump’s lack of control over facial expressions. Trump’s visible facial expressions included pursed lips, pouting, furrowed brows, rolling of the eyes, and finger pointing. His nonverbal behavior can be summed up in one phrase: arrogant bullying. Clinton’s smiling during Trump’s negative attacks. Hillary Clinton demonstrated significant restraint during Trump’s repeated verbal assaults. I would have loved to have asked Clinton, “Penny for your thoughts” during those moments. Never before has a politician’s nonverbal language been scrutinized as much as Hillary Clinton’s. When she doesn’t smile, media advisors say she needs to smile more. When she does smile, advisors say she needs to tone down the smiling. It seems that no matter what she does, it’s just not right. I thought she handled Trump’s assaults with grace and professionalism. Some people may have perceived her smiles as artificial, however, I felt she used smiling as a way to remain positive in her remarks. Closing handshake. Well, despite the unprecedented lack of a handshake at the beginning of the debate, the Presidential candidates enjoyed a closing handshake at the end of the debate. Was it because they felt all warm and fuzzy from the closing question, which asked each candidate to say something positive about the other? Hmmm…..Change of heart or following protocol? Unfortunately, I don’t have the capability of reviewing Trump’s or Clinton’s micro expressions using slow-motion replay technology. Psychologist Dr. Paul Ekman co-discovered the phrase micro expressions. These brief facial expressions (lasting just 1/15 to 1/25 of a second), can reveal a deeper or masked truth about a person’s attitude or behavior. Examples include quick raising of the corner of the lips, expanding or contracting of the iris, narrowing or opening of the eyes, etc. Ekman’s work became the basis for a FOX television program, Lie to Me, which ran three seasons, 2009-2011. A short Guide to Reading Micro Expressions may prove helpful in deciphering the facial expressions during this second debate. The lesson: Become aware of your nonverbal language because it speaks volumes about who you are as a person and who you are as a professional. 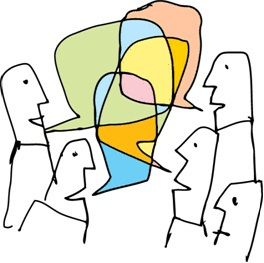 Are you presenting yourself well through your nonverbal language? What Makes Your Day Great? One statement that can make your day a great one is a sincere “Thank you.” It’s a simple statement, one of the most common that you hear. When you are on the receiving end of “Thank you,” something wonderful happens. You feel recognized, valued, and appreciated. You feel like the other person took the time to speak from the heart. 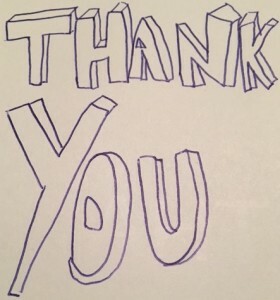 One such thank you arrived in our mailbox recently. It was sent to my husband and me by our “adopted” godson, Ethan. I say adopted because we are not his official godparents, rather, we are godparents to his older brother, Andrew. Truth be told, we’re also adopted godparents to their older sister, Alexis. 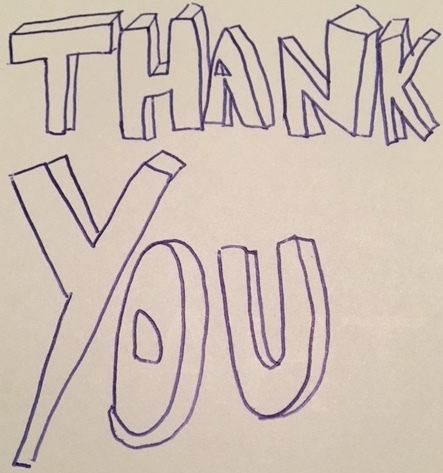 From the outside, it looked like a normal thank you card from American Greetings. The sentiment inside is what truly made my day. On the inside left panel was a huge THANK YOU, perfectly handwritten in all caps. The note began with an appropriate salutation: “Uncle Christine and Aunt Mark.” Years ago when the kids were still living at home, their mom, one of my best and longtime friends, made the mistake of mixing up our names. When all three kids heard it, they burst into laughter. Somehow, it magically stuck, and it has been that way ever since. That happy accident became a new moniker for us. I am Uncle Christine and Mark is Aunt Mark. Ethan just began his freshman year of college. He was thanking us for his graduation gift and something more. He was thanking us for being who we are, and for being in his life. I love his first sentence: “You two are some of my favorite people on the planet.” The note continues with “I look up to you two more than anyone in my life and I’m not just saying that.” He went on to tell Mark and me how he feels about us. His note was very touching, and yes, it made me teary-eyed. Poetry and songs relate to this solo journey called life. We can sometimes feel alone, undervalued or under appreciated, like we don’t matter, or like people don’t care. Then we realize – through some small recognition by other people – that we are not alone, that we do matter, that they do care, that we have influenced their lives in some way…just like Ethan’s note stated. Let me ask you this: Who was the last person you said “thank you” to? Was it a clerk at a store? A server at a restaurant? A co-worker? A team member? Your spouse? Your partner? Never underestimate the power of thank you. You just might make someone else’s day.